The future is back. Are you ready? 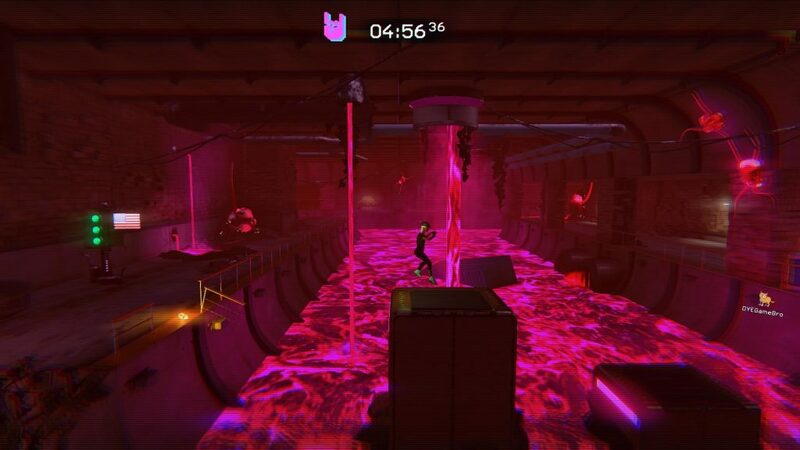 This is what the game told me is going to happen, and like so much gravy – the 80s aesthetic was heaped upon my eyeballs until I couldn’t help but realise I was awash in a sea of RAD. I was about to enter a world of Cyborgs, Communists, Insectoid Invaders, Blood Dragons, Ancient Spirits and Attitude. Teenagers, Dirt Bikes and Guns. Definitely not a bad idea. 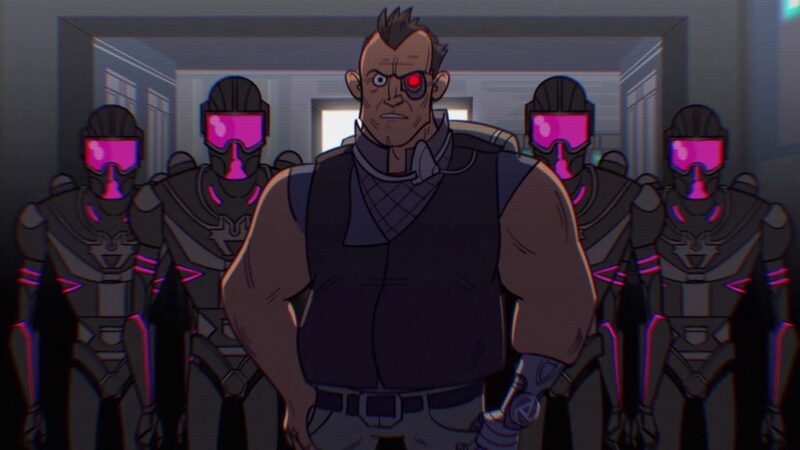 Trials of the Blood Dragon is the demented love child of the beloved Trials series, and the much lauded Blood Dragon DLC for Far Cry 3. This would prompt the first major question – How the heck does that even work? Given that one was an over the top 80’s inspired first person shooter, and Trials is a long time frustration simulator – Sorry, ‘platform racing video game series’ – How on earth do you cross-pollinate such things? Apparently like a child playing with action figures, you mash the two together furiously until the separation between them blurs, and you end up with this odd, yet uniquely cohesive experience. 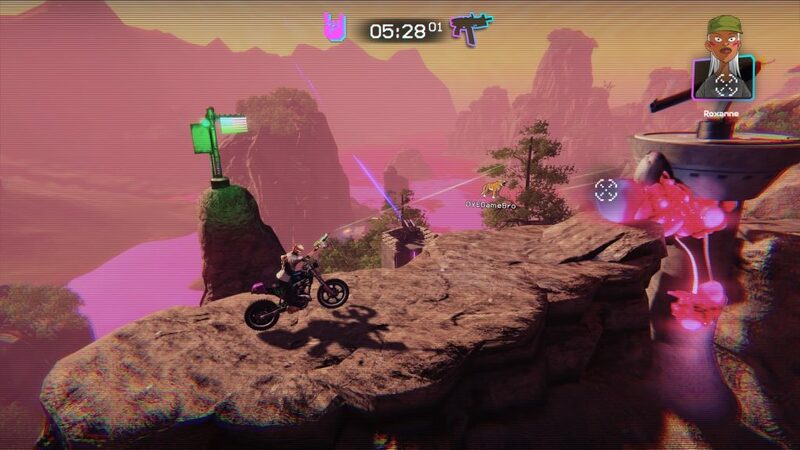 Trials of the Blood Dragon retains the gameplay you have come to expect from a Trials title, while also throwing a serious spanner into the familiar state of things by introducing you to on-foot sections, and shooter elements. Now, it’s hard to truly criticise the on-foot sections, as they are an oddity within a series – and to argue you have experienced similar gameplay in a better capacity just feels at odds with what you are actually experiencing. If a game developer is well known for perfecting a type of gameplay that is entirely momentum based, and tied explicitly to balancing a dirtbike riding player character, how much free reign do you have to truly complain about their attempt at something different? It entirely feels like criticising a chef that is world renowned for his dessert dishes, because you tried his meat pie and it was a bit average. But let’s address the elephant in the room – The platforming sections aren’t great. Now, I need to be clear here – they are not entirely bad either. The player character controls in a way that is not as responsive, or as quick as you might expect – and your shooting controls are a very simple ‘twin-stick’ style, where you simply point and the bullets will let fly – but if you asked me: ‘Can you navigate a level from start to finish, on foot, and enjoy yourself?’, my answer would be clear, you absolutely can. However it is not without frustration. There will be moments where you might die to something that seems entirely avoidable, but a dodgy jump left you smeared on the ground. This is almost mitigated entirely by the nature of the Trials formula, where mistakes can be quick and common – and a second chance is given with a simple press of a button. With plentiful checkpoints, and a happy realisation that on-foot sections are absolutely a minority of the provided levels, you can accept them for what they are, and move on. This leads me to the beautiful part of this particular entry in the Trials series, and what has me truly impressed. The game’s focus is definitely less on technical riding – with near infuriating sections designed to reduce a grown man to tears – and instead on spectacle and forming an experience that is enjoyable alongside a particularly goofy narrative. This has been an item of contention for existing fans, with a great deal of feedback from many players simply stating: ‘It isn’t as challenging as they would like’. The biggest hook that this game has to offer is probably the fact that it is the first Trials game to feature a fully fledged, narrative-driven story. And by this, I mean an actual plot. Sure, it’s 90% explosions and 80s-inspired cliches, but there is actual character development, twists and a climactic ending. To further accommodate this, the game also has full voice over and cut scenes – and this is perhaps where my biggest criticism of the game has to be made clear. The inter-level cut scenes at first appear to be stylised to appear very simplistic, but it quickly becomes apparent that the quality of these cut scenes has such a huge margin for difference in quality that you will find at times you are just left in awe at how bad it can look. This is also similar in the voice acting for the game – Both of the player characters are obviously voiced by young people that suit the age of the characters, however their performance is just so erratic and flat out bad, that I question whether or not maybe they are the children of someone who works at Ubisoft. This is compounded by the fact that the rest of the game’s voice acting is top notch, with most of the other staple characters just laying waste to the quality of the player characters – It’s jarring to say the least. 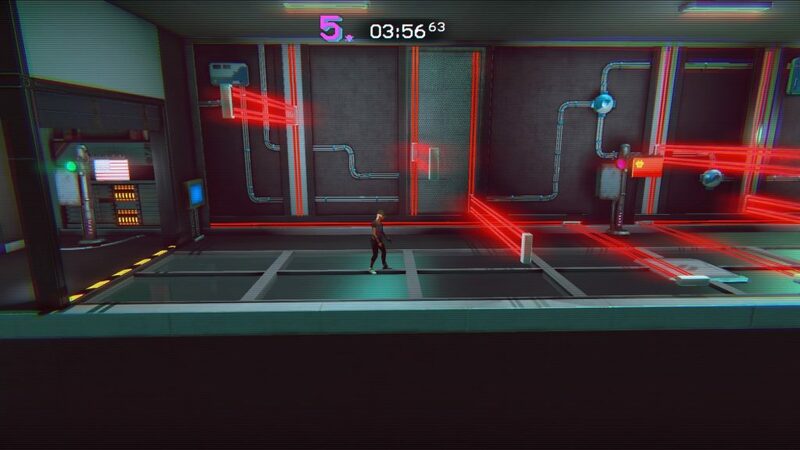 Neon Pink is very much a recurring thing in this game. You have been warned. Regardless of these (admittedly) cosmetic criticisms, I still found myself having a ton of fun with the game. Levels always seemed to have the right amount of challenge to them, and the variety of different vehicles that crop up throughout the games campaign made sure the gameplay never felt stale. Ranging from an 8-wheeled tank, to a mine cart, to a level that was flipped upside down and vertical at times, the actual gameplay experience was always unique and fresh. Coupled with the absurd premise and constantly finding new and genuinely funny ways to up the ante, it was a game I was happy to binge through for a few hours – and even dig up some excuses to replay sections for the sake of chasing a slightly better score. And at the paltry cost of $15AUD it’s definitely got the right price tag for what it is trying to accomplish. 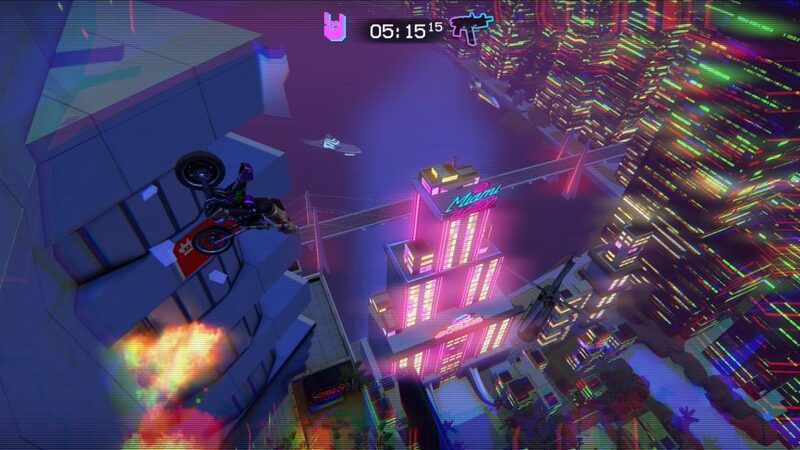 Whether you are an established Trials player looking for a unique spin on what you’ve come to expect from your Trials experience, or a long suffering wannabe Trials player that has suffered through the frustration of advanced gameplay requirements, Trials of the Blood Dragon should have something for all tastes.